The desire to be “Green” and save money have made Tankless Water Heaters a must have product. R.J. Tilley’s plumbers can install a new tankless water for you. A tankless water heater heats the water only as it is needed providing more energy efficiency than a traditional water heater. The result is endless hot water in a matter of seconds while saving energy and space. Hot water is not delivered instantaneously. Just as in the case with storage water heaters any cold water in the pipes needs to be pushed out. Tankless water heaters have a life expectancy of about 20 years compared to storage water heaters lasting 10-15 years. Tankless water heaters come in both electric and gas versions. The decision to select an electric or gas heater should be made with the homeowner’s circumstances in mind. Let us help you make the decision. 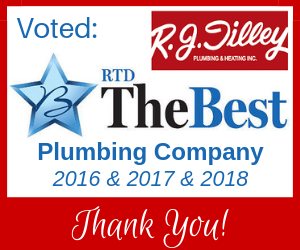 Whether you are ready to install a tankless water heater or have a need for a new traditional water heater, call the best plumber in Richmond, R.J. Tilley. “We can fix that”.